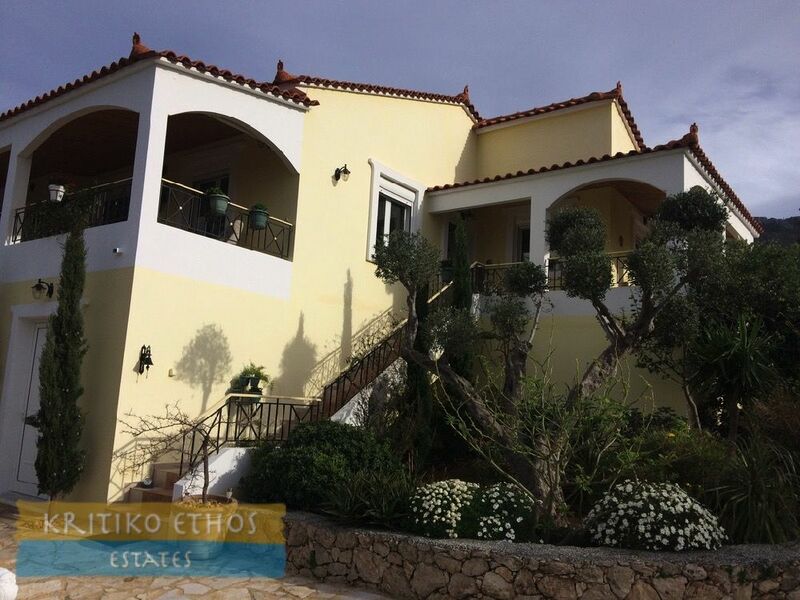 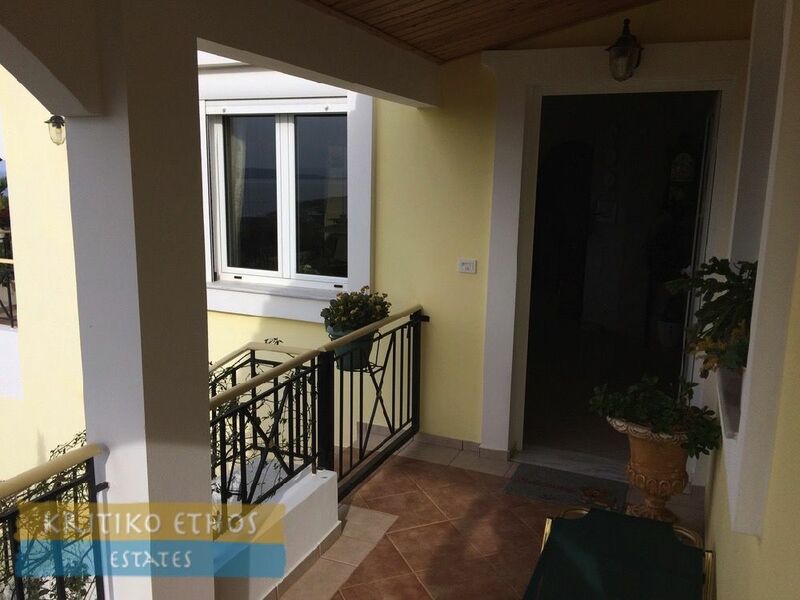 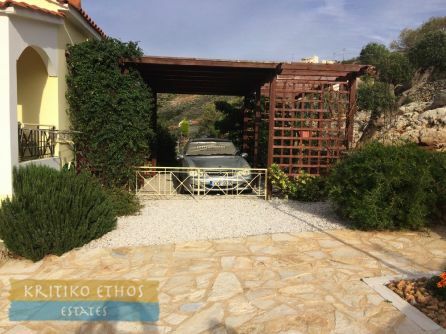 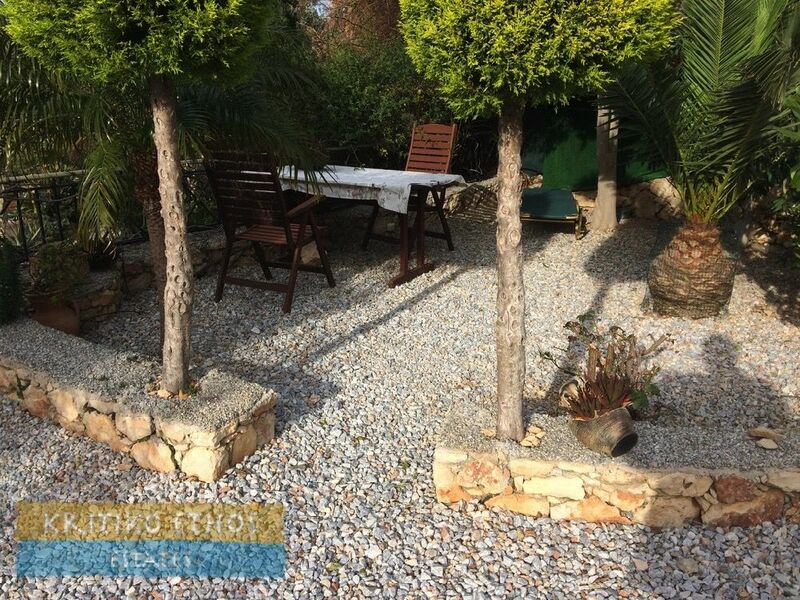 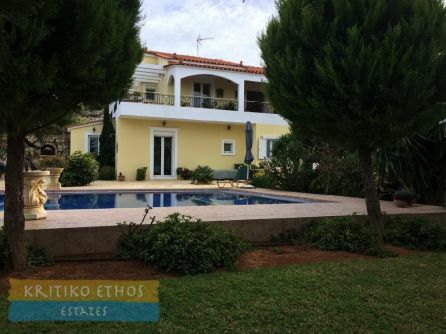 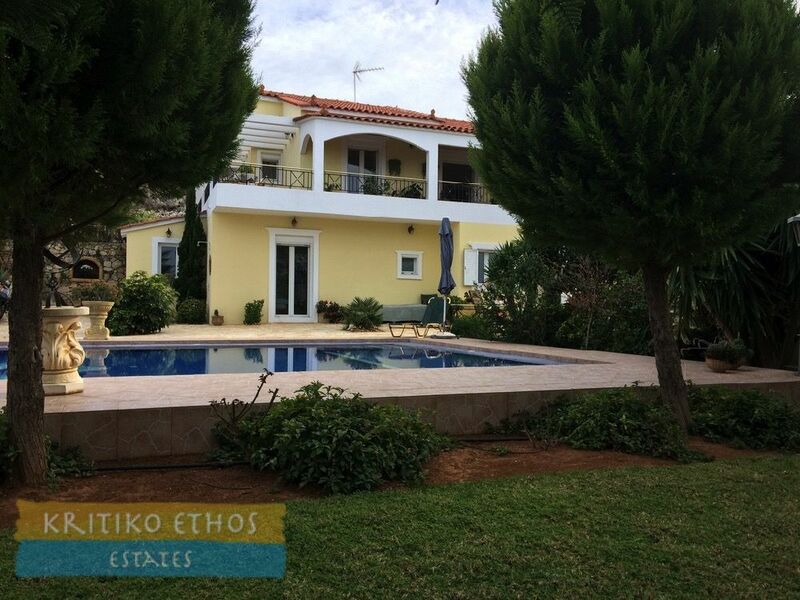 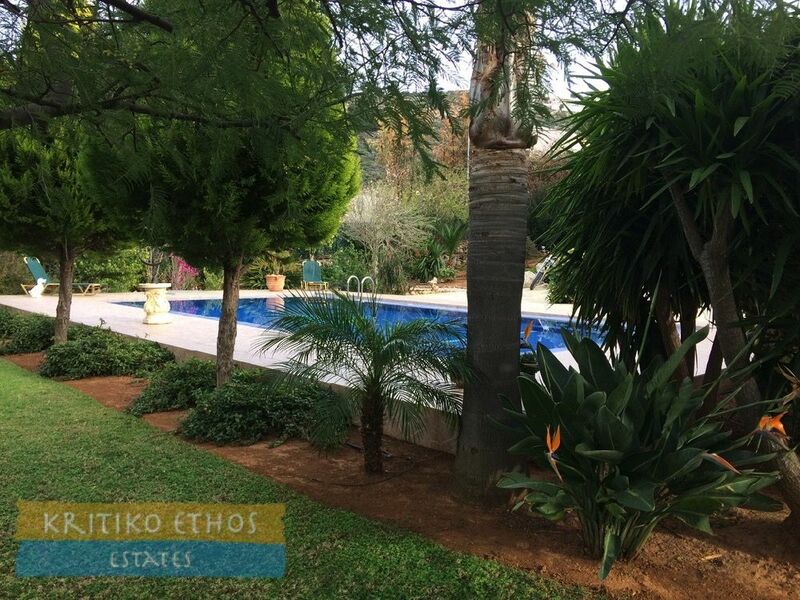 This truly beautiful three+ bedroom 150 sqm home is situated on a large plot of about 3,000 sqm with simply superb sea views. The home has been perfectly maintained and cared for and is in pristine condition. 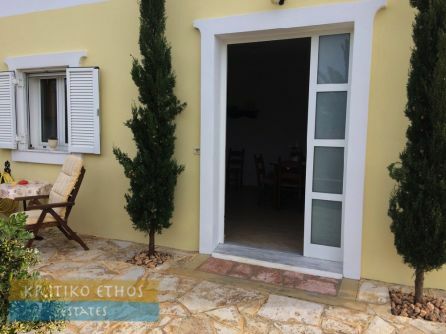 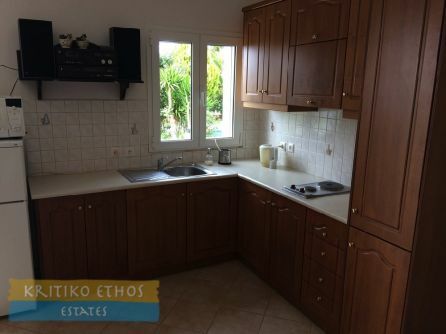 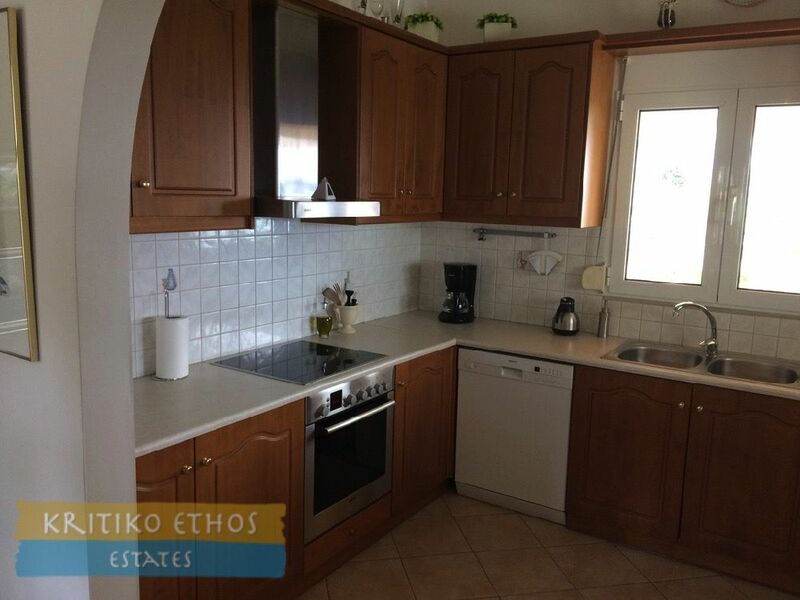 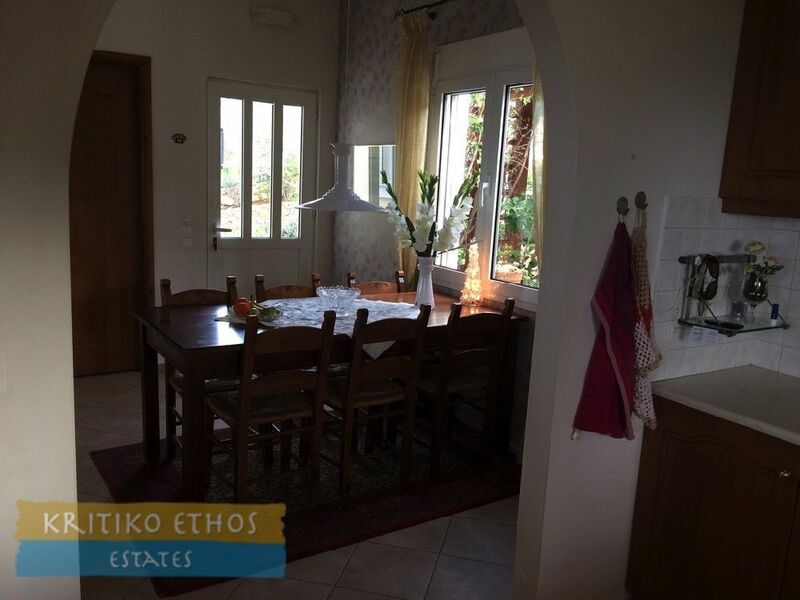 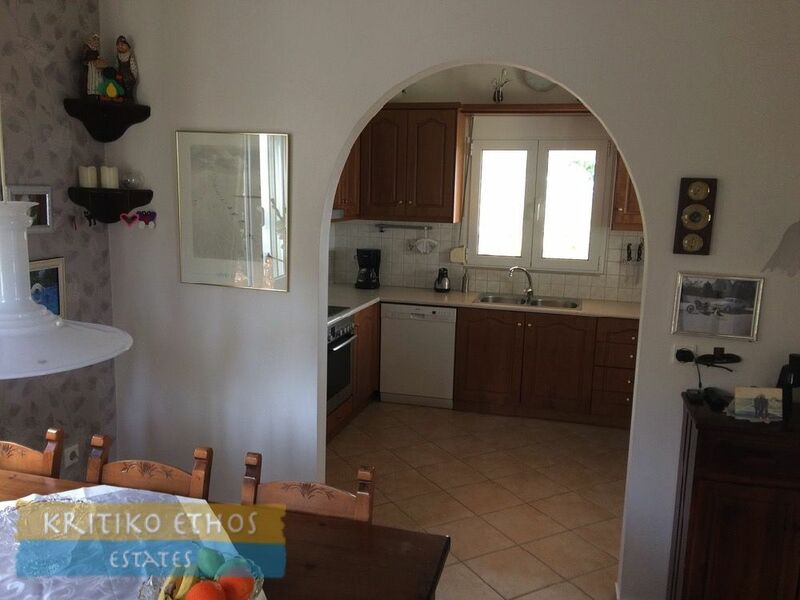 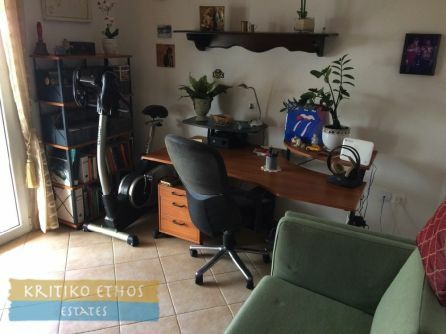 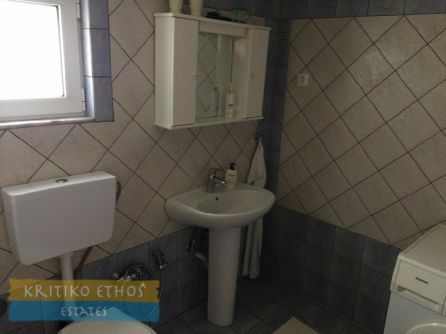 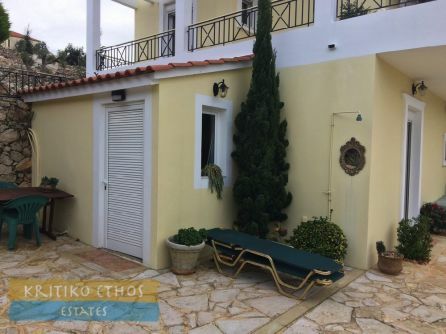 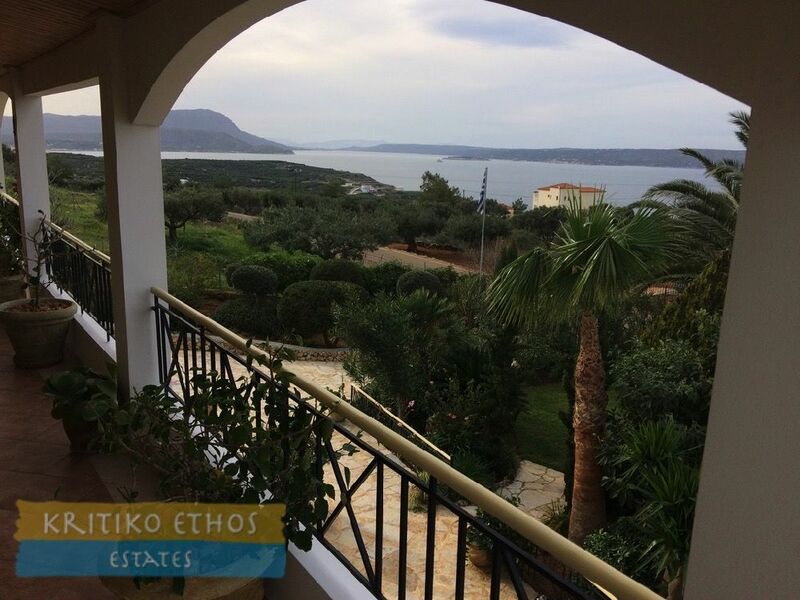 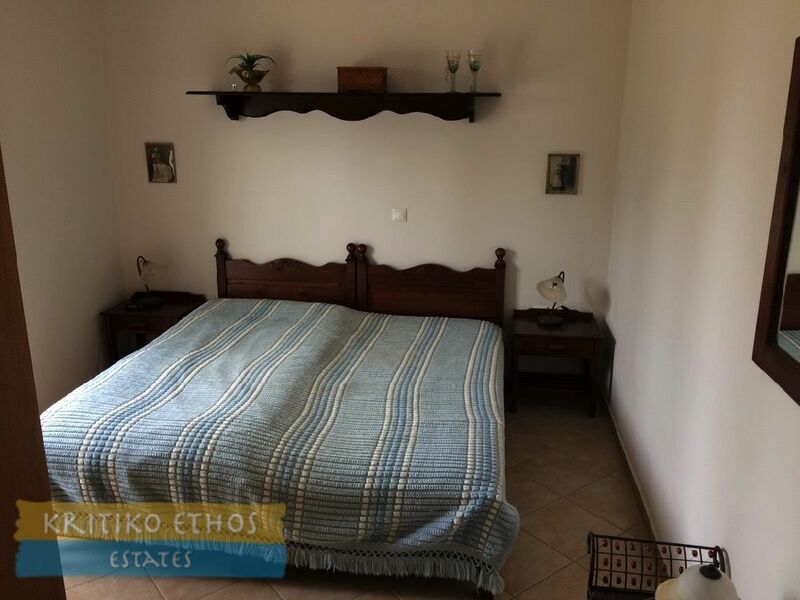 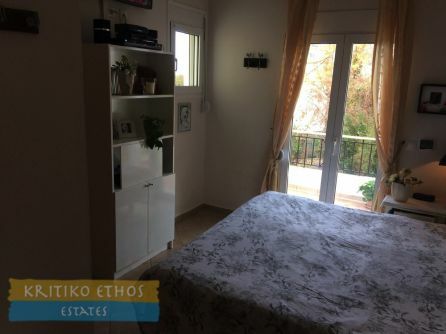 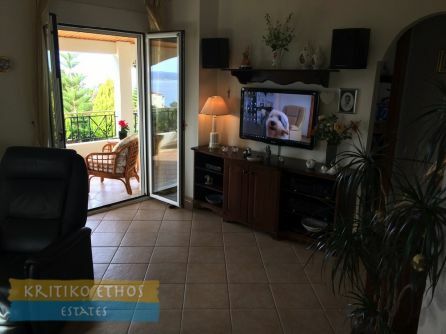 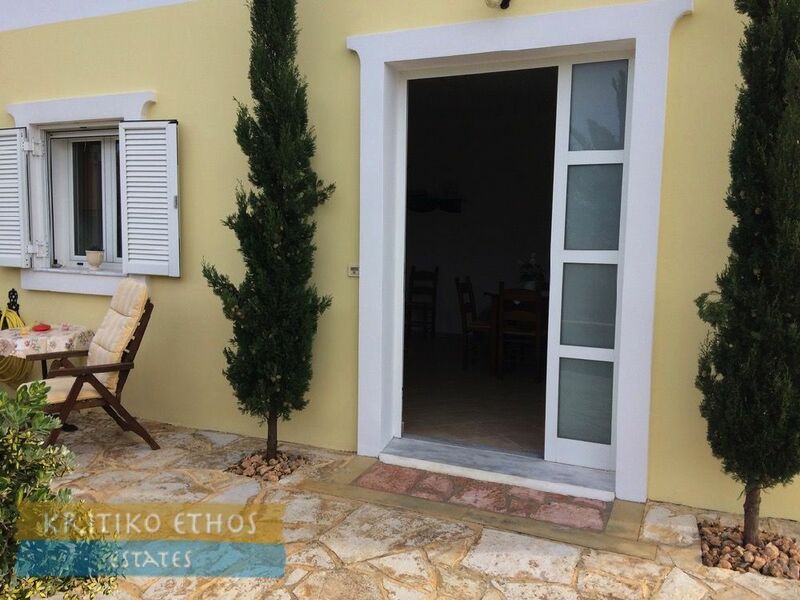 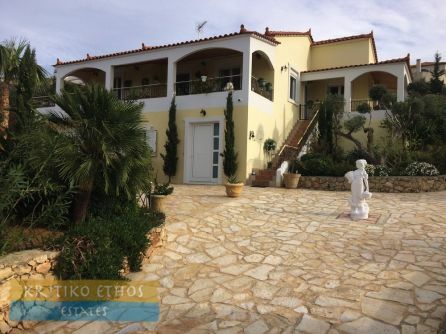 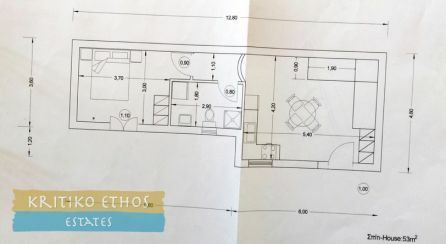 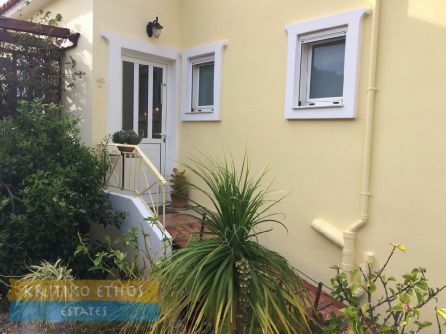 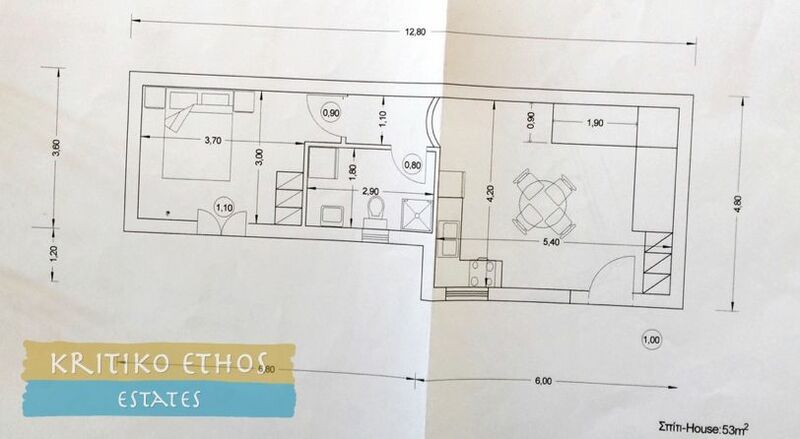 It is a perfect permanent residence here in Crete and also has excellent summer rental possibilities, either for the ground floor apartment or the main home, or both! The home has very spacious covered as well as open verandas, a very inviting 50 sqm private pool, a separate one-bedroom ground floor apartment, and very tastefully landscaped gardens. And it offers excellent views to Souda Bay as well as the Akrotiri Peninsula and the open sea and great mountain views as well. 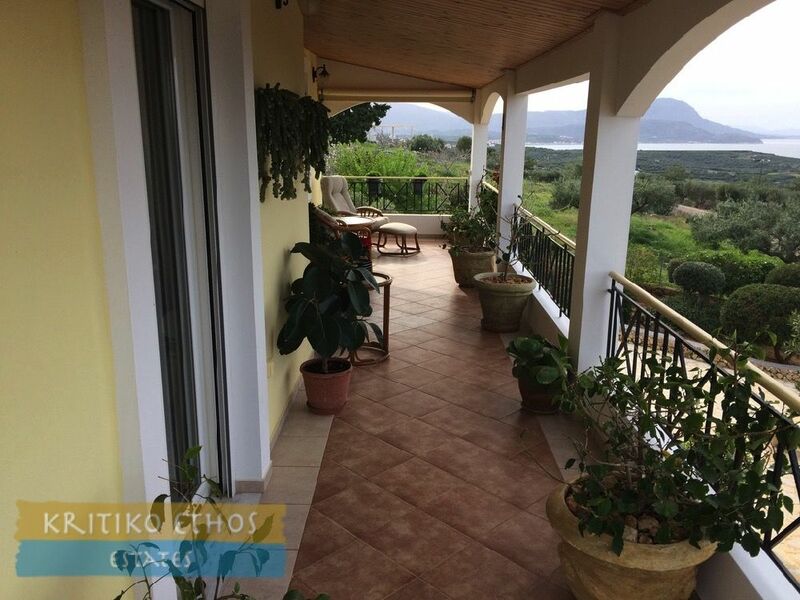 The setting is very private and secluded and the peace and beauty of Crete can be enjoyed throughout. 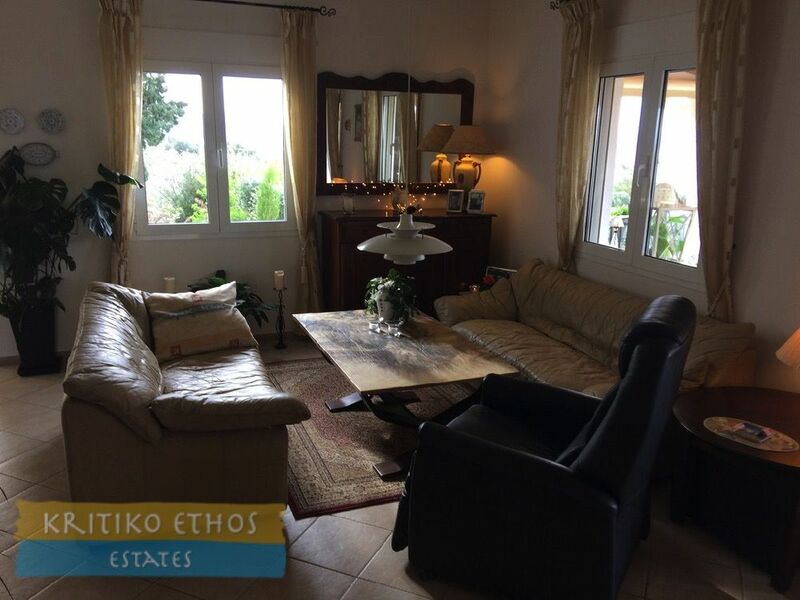 The spacious sitting room has large windows facing the sea and French doors open to the broad covered front veranda overlooking the pool. 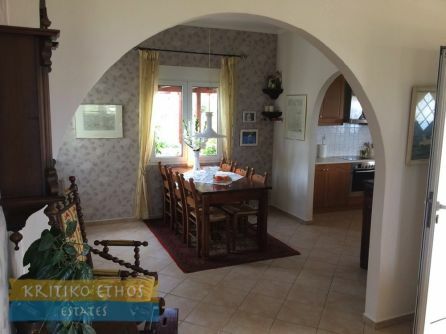 The dining area is situated to the rear of the sitting room and separated by an arch with the kitchen off to the right, again separated by an arch. The large modern and fully-equipped kitchen is a cook's delight with plenty of worktop and cupboard space. 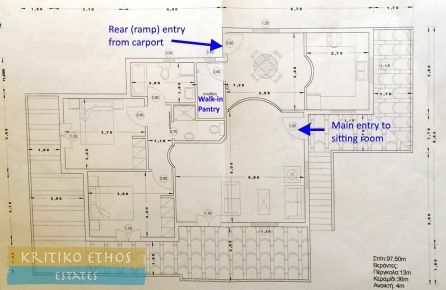 The walk-in pantry is located just off from the dining area and (as mentioned above) an external door leads from the dining area to the rear terrace and carport. The sleeping area to the side of the sitting room has two large double bedrooms, each with access to the upper-level terraces. 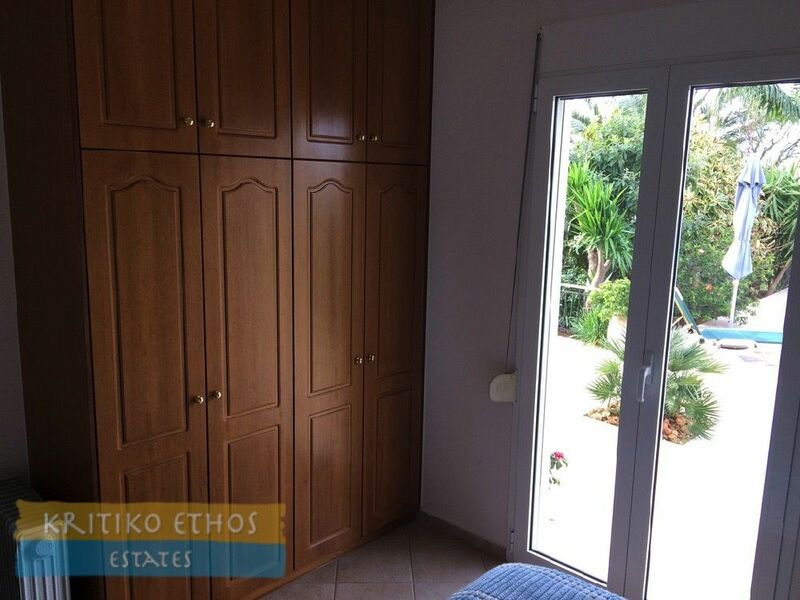 Both bedrooms have large built-in wardrobes. 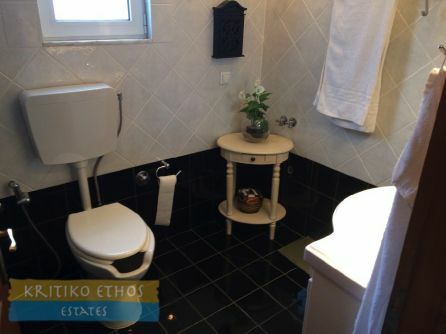 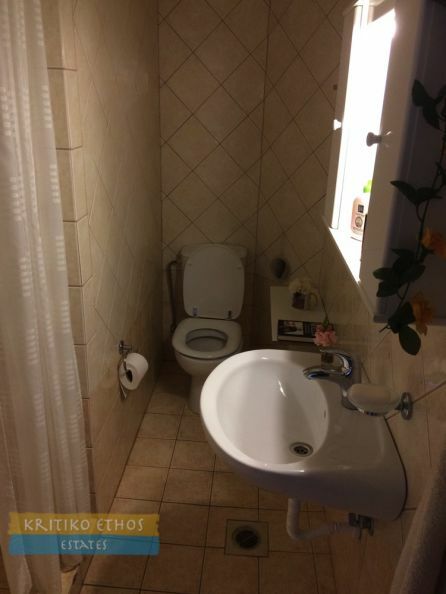 There are two bathrooms in this area, one with a full bath and the other with a fully-tiled shower. 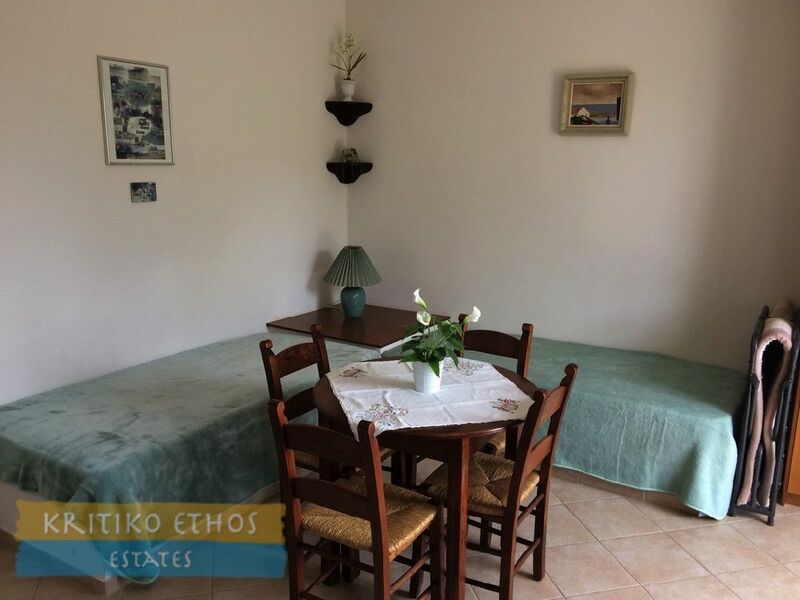 The guest apartment is on the lower level and comprises a large open plan sitting and dining are with two beds for extra guests. 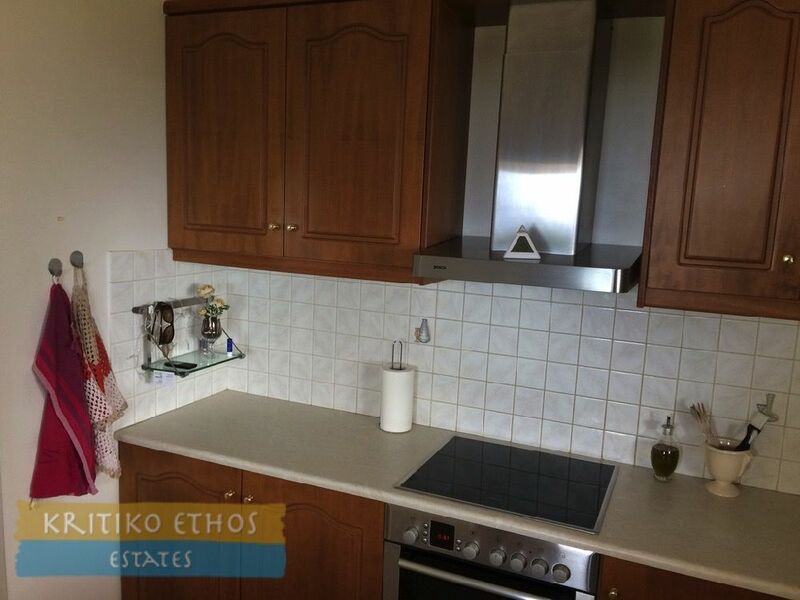 The bedroom and shower room are to the left of the kitchen/dining room. 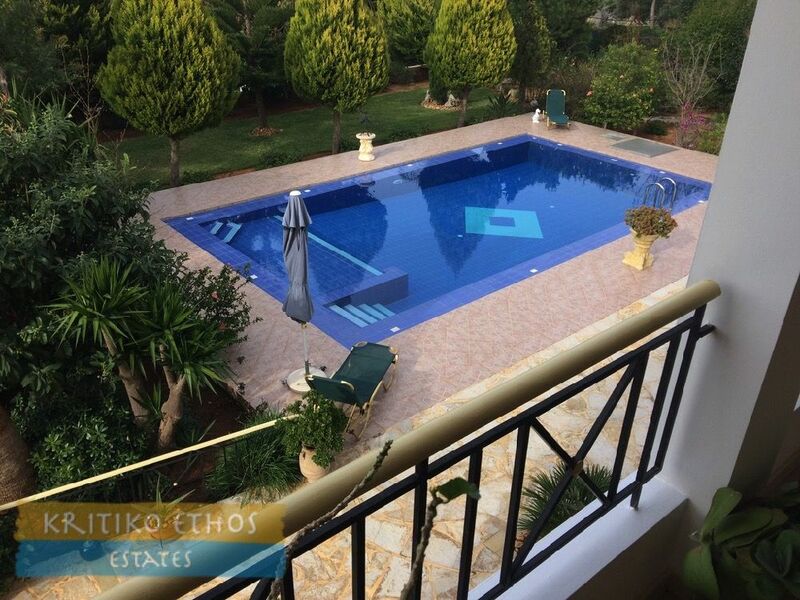 French doors lead from the bedroom to the pool terrace. The beautiful 50 sqm pool with its large tiled terrace is a great place to enjoy the sun as well as the lush and colourful gardens. 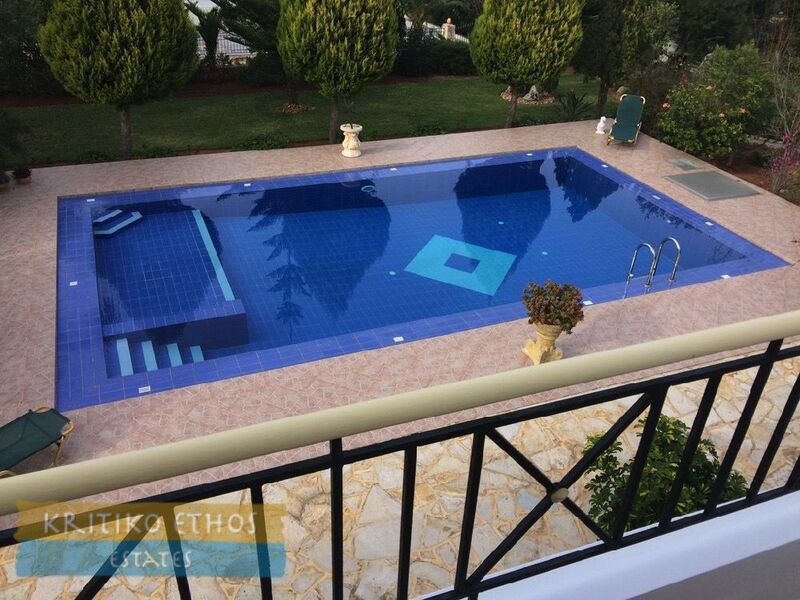 The built-in barbecue terrace is set to the rear of the pool. 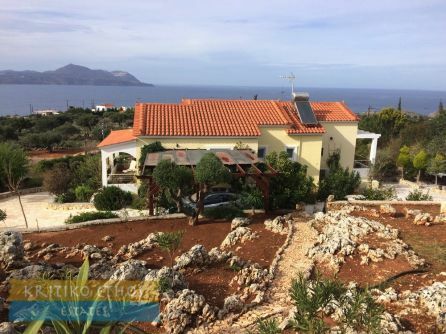 The entire plot is bounded by stone walls and fencing and has been completely landscaped with the rear gardens built around the natural rocky slope of the land. Automatic irrigation has been installed for ease of maintenance. 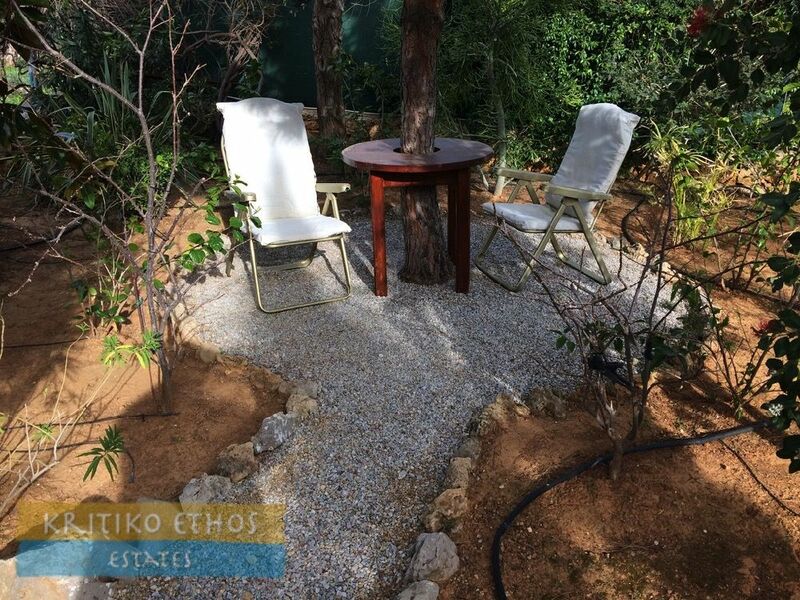 Several shaded and private seating areas have been set within the gardens. 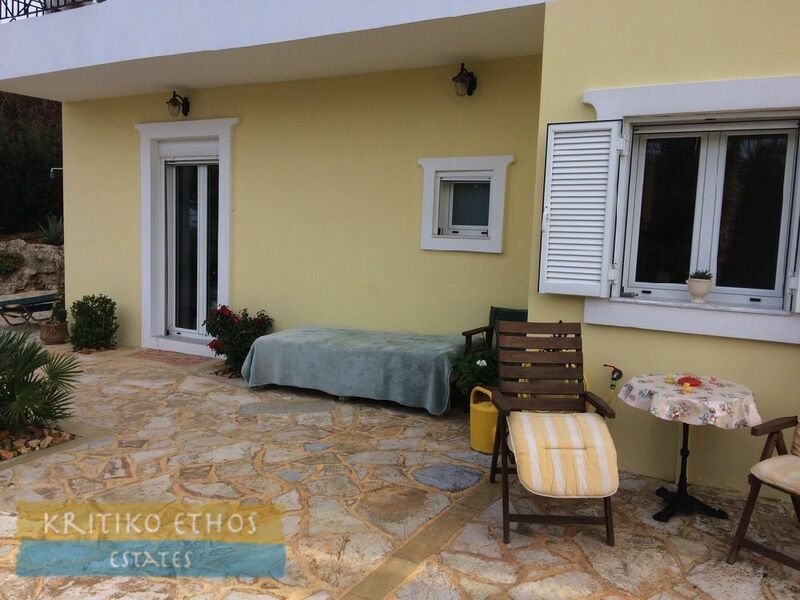 There is a large external storeroom adjacent to the home … very useful for pool and gardening equipment. The home is within easy walking distance of the beautiful swimming and snorkeling cove at Koutalis and just a short drive from the fine beaches and amenities at Almerida, Plaka, and Kalives.